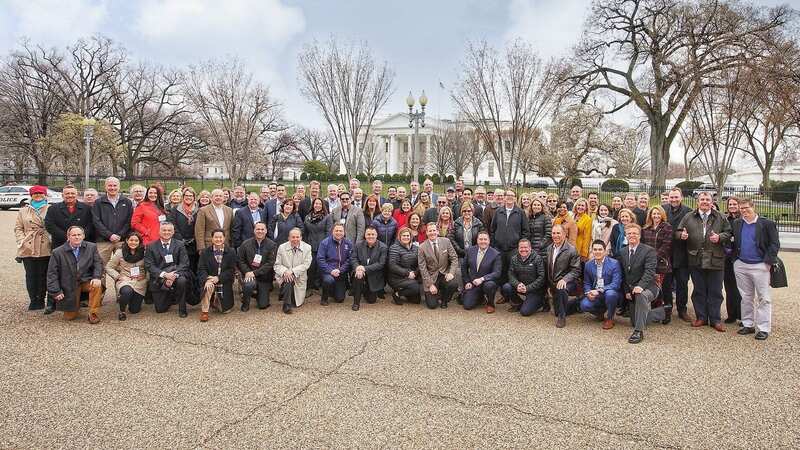 More than 90 Society of American Florists members representing all industry segments, three countries, 25 states and the District of Columbia, traveled to Washington, D.C., this week to meet with lawmakers and key congressional staff. More than 90 Society of American Florists members representing all industry segments, three countries, 25 states and the District of Columbia, traveled to Washington, D.C., this week to meet with lawmakers and key congressional staff. 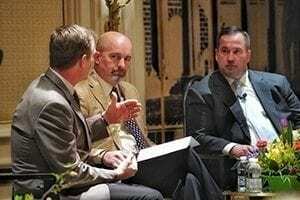 While there, the group advocated powerfully for issues that are critical to the success of retail florists, wholesalers, growers and suppliers — and the overall health of the floral industry. This year’s event featured a direct address from a California congressman with personal ties to the floral industry, a spirited and bipartisan talk about high-profile issues from D.C. insiders, an address from a veteran network journalist — and a nearly three-hour White House briefing created especially for SAF, featuring remarks from and Q&A sessions with seven top administration officials. Chris Drummond, AAF, of Plaza Flowers moderated a bipartisan discussion between Jim Richards and Mike Smith of Cornerstone Government Affairs in Washington, D.C.
For many SAF members, the chance to be on the Hill with their industry peers, speaking to lawmakers, has become a highlight of their calendar. “Over the years, I’ve found it very important to be here, and I would encourage everyone to come,” said Karen Fountain, AAF, of Flowers ‘n’ Ferns in Burke, Virginia, who was on Capitol Hill attending CAD for her 27th year this week. Art VanWingerden of Metrolina Greenhouses Inc. said he knows firsthand how long it can take to change laws — but he also understands on a deeply personal level the potential pay-off. VanWingerden spent about five years fighting to improve outdated zoning laws that were adversely affecting his growing operation in Hendersonville, North Carolina. The effort was contentious, expensive and time-consuming — but he ultimately prevailed and helped write the new law. 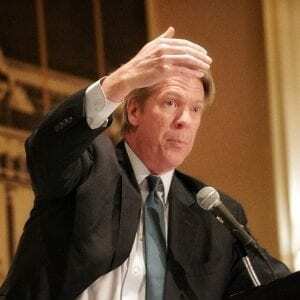 During the annual SAFPAC Fundraising Dinner, CBS News’ Chief White House Correspondent Major Garrett detailed his experience covering the 2016 presidential election. For other attendees, this year’s event represented a new opportunity to learn and engage. Hannah Crittenden, who graduates with a degree in supply chain management this spring from Michigan State University, attended this year as one of 23 first-timers alongside her father, Rod Crittenden, head of the Michigan Floral Association. 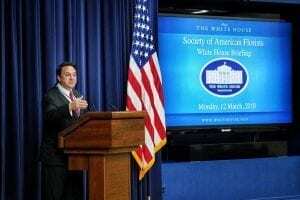 Steve Munisteri, deputy assistant to the president and principal deputy director, Office of Public Liaison for the White House, talks to CAD attendees during Tuesday’s briefing. Expert Takes. 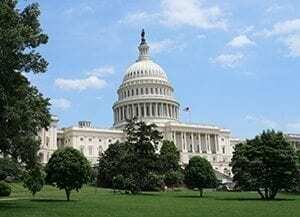 Before heading to Capitol Hill, attendees were briefed on the year’s issues: key fixes to the country’s immigration system and funding for the Floriculture & Nursery Research Initiative and Floriculture Crops Report. Terril Nell, Ph.D., AAF, research coordinator for the American Floral Endowment and former SAF president, presented an overview of the Floriculture & Nursery Research Initiative (FNRI) — and how that effort has benefited all segments of the industry, along with the general public, bringing some of the top academics and researchers to work on the industry’s biggest challenges, including post-harvest technology and pest and disease management. White House Briefing. Seven senior-level administration officials briefed SAF members at the White House during a lively session that lasted more than two hours and featured frequent Q&A sessions. CAD members heard directly from White House officials on issues of immigration, drug enforcement, health care, tax reform trade and labor. Jim Carroll, deputy director and acting director of the Office of National Drug Control Policy and previously assistant to the president and deputy chief of staff, detailed his work on the opioid crisis, and how that issue is hurting American families and businesses. He also memorably recounted his own family’s long history in the floral industry, dating back to the early 20th century, when his grandparents and later his parents operated a florist and growing operation in Alexandria, Virginia — the Alexandria Floral Co.
Look for much more coverage of CAD in the April/May issue of Floral Management and next week in EBrief. If you attended CAD and have a follow-up story to share, email mwestbrook@safnow.org.